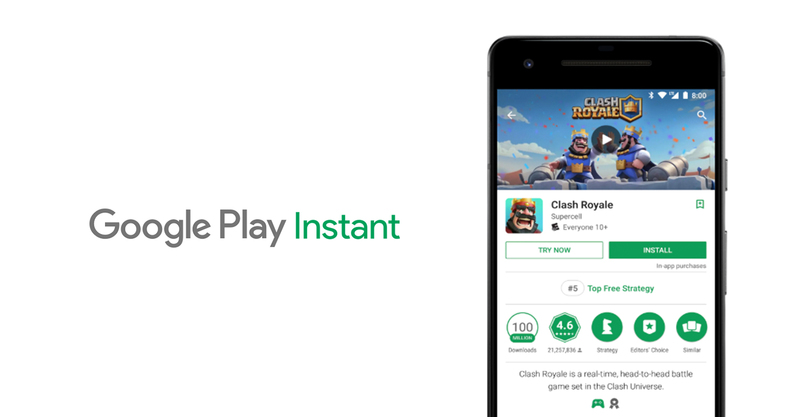 Google Play Instant enables people to experience your game or app natively without having to go through a full installation process. Removing the friction of installing is a great way to increase engagement, conversions, and lifetime value of your users. Today, we've made it easier to build instant games and apps by removing the URL requirement. Previously, in order to publish an instant game you had to create a web destination for it. The website also had to be connected to the instant game through intent filters and digital asset links verification. Now, it is no longer required to add URL-based intent filters to your instant game. 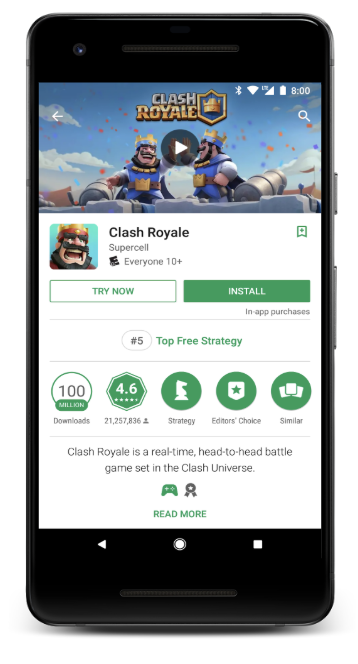 People will be able to access the instant experience through a 'Try Now' button in the Play Store or Play Games apps, via deep link API, and in the future through the app ads. While being particularly helpful for games which often don't have a corresponding website, the new URL-less functionality is available to both game and app developers. Game developers using Unity or the latest Cocos Creator can take advantage of URL-less instant games by simply leaving the URL fields blank in the setup process. First, make sure you're running Android Studio 3.2 or newer by either updating or downloading it here. Make sure to install Instant Apps Development SDK 1.3.0 or higher from Android SDK Manager. Then download a sample instant app from GitHub. In Android Studio, click File → New → Import Project… and import the downloaded "urlless" sample. Lastly, after gradle tasks are finished, click the green "Run" button with "instantapp" configuration. You should see an instant game on your attached device. Instant runtime found and launched the entry point activity in your game with the ACTION_MAIN and CATEGORY_LAUNCHER intent filter. Give your sample game a unique applicationId in app/build.gradle file by replacing existing applicationId - we don't want different applications with the same id. Generate signed APKs for both installable and instant version of our sample game. Choose APK for both "app" and "instantapp" modules. In the Play Console, create a new application, upload APK under "App Releases" tab, and then upload "instantapp-release.zip" under "Android Instant Apps" tab. The installable app must be rolled out before the instant one. The rollout process may be familiar to most Android developers, but here's a step-by-step guide in case you run into any issues. MY.PACKAGE.NAME refers to applicationId that you have replaced in app/build.gradle file. With the launch of Android App Bundle we are excited to further simplify the developer experience for Google Play Instant. In the coming months we are making it possible to deliver your app's or game's dynamic features instantly from the same bundle as your installable app or game. Stay tuned! Check out more information on Google Play Instant, or feel free to ask a question on Stack Overflow, or report an issue to our public tracker.